As part of a Fulbright research grant, political science professor Robert Mortimer and his wife Mildred have been in Dakar, Senegal since January where he directs the West African Research Center, an organization that promotes collaboration between American and African scholars who are conducting research on West Africa. The center is located in the diplomatic neighborhood of Fann-Residence, not far from the University of Senegal and the Corniche - a seaside drive along the Atlantic Coast. For his own research, Mortimer is looking into the creation of a research program which would focus on the relative effectiveness of literacy instruction in the national languages of Senegal (Wolof, Pulaar and Serere) versus French, which has remained the language of instruction in the Senegalese school system since the country's independence from France in 1960. This is the Mortimers' third research trip to Senegal, having previously visited for a year both in the late 1960s and in the early 1990s. Thanks to the Internet, Rob was able to e-mail Haverford News with a personal account of "this fascinating country." In the following e-mail sent to Haverford at the end of March he takes a look at modern Senegal, President Clinton's visit to Africa and the challenges Senegal faces in its upcoming May elections. Can you paint a picture of life in Senegal for us? I am in Dakar, the capital of Senegal, which is located on the Cap Vert peninsula at the extreme western point of the continent. Dakar has always been cooled by the western sea breezes, but since the drought and deforestation of the 1970s and 1980s, it is also subject to hot winds (the harmattan) which bring sand and heat to the city when they prevail. The town, like all Third World cities, has also grown uncontrollably and in an unplanned manner since independence in 1960. It is now jammed with diesel-burning "cars rapides" (the most popular way of getting around) which create lots of traffic congestion and vehicular pollution. Dakar is developing in other ways as well. 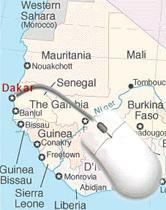 For example, with regard to the World Wide Web, "cybercafes" where Senegalese can get on-line for awhile for a reasonable fee have sprung up all over the city. Is the Center or any of its visitors or scholars involved in President Clinton's trip to Senegal? It has been interesting to observe the diplomatic preparations for the President's trip to Senegal. About a month ago, we received a White House advance team who breezed rapidly through here early one Saturday morning because the Center was being considered as a site for an announcement of an educational initiative toward Senegal during Clinton's visit. I had proposed several possible themes to the U.S. Ambassador, Dane Smith, who is an old friend, but we did not make the final cut for the President's itinerary. Not all the details of his activities have been made public yet, but Clinton is leaning toward highly symbolic gestures such as a trip to the Grand Mosque (presumably to challenge the controversial Huntington thesis about "clash of cultures" by acknowledging Senegal's politically moderate and culturally tolerant brand of Islam) and a visit to Goree Island whose Slave House stands as a reminder of the horrors of slavery. Does the location of the upcoming summit meeting in Uganda suggests , as one Times' reporter wrote, that the U.S. cares less about African countries which are establishing "full-fledged democracies than about those developing their countries?" Much has been made of the choice of "no-party" Uganda as one of the countries on Clinton's journey. Certainly Uganda under Museveni is no model of democracy although it has come a long way from the depredations of the Idi Amin era. Museveni represents a tough new breed of leaders who won power by the force of arms overthrowing highly autocratic regimes. His role in the events of central Africa last year leading to the demise of the Mobutu regime in Zaire/Congo established him as a regional power to be reckoned with--and he has been a devoted disciple of World Bank orthodoxy. Clinton has pursued an essentially realist strategy in choosing to visit regional influentials rather than paragons of democracy. Even the stop in relatively democratic Senegal reflects geopolitical variables, in this case the U.S. interest in moving more deeply into those francophone states that were long tightly held within France's sphere of influence on the continent. What do you think thus far of the points Clinton is making? By and large, Clinton seems to be hitting the right themes during the first few days of the visit - including his brief stopover in Rwanda to deplore the U.S. and international community's terribly inadequate response to the 1994 genocide there. He has, of course, emphasized economic issues in the wake of the House's recent passage of the Trade and Investment Act which was itself programmed to precede the presidential trip. No doubt he'll say the right things about human investment - literacy and further resources for all forms of educational enrichment which is still the most crucial underpinning of African development. Senegalese businessmen are knocking down doors in hopes of meeting the President and some of the entrepreneurs along for the ride. I'd still like to see him meet a few teachers out in the countryside even if he doesn't meet the researchers around the Center. Senegal is gearing up for its own elections. What are some of the major issues and concerns? I arrived in time to observe the political campaign for the May parliamentary elections here. One of the opposition party leaders lives only a few blocks from our apartment, so we often can hear the sound of a political rally wafting across the backyards (sometimes drowning out the call of the muezzin to evening prayer which we often hear from a mosque in the neighborhood). The Senegalese are hoping that at long last this will be a free and fair election. A friend and colleague of mine from the political science department at the University of Dakar, is a member of the official board which has been set up at the demand of the opposition to oversee the electoral process. I know that he will do his best to guarantee the transparency of the process, but such openness is difficult to achieve in countries where the same party has been in power for decades and where political patronage is a very valuable commodity. The ruling Parti Socialiste has just pushed through a controversial expansion of the membership of the National Assembly which could allow for more patronage by raising the number of deputies from 120 to 140 and adding a "Senate" of 60 members to the country's institutions. For most of the opposition parties, this is the last thing that Senegal needs at a time when it can not hire the most recent class of graduates from the Ecole Normale Superieure, which has always trained the country's top secondary school teachers. There is concern that this expansion may also push through another electoral victory for the ruling party by giving them control over the rural polling places, despite the efforts of the ONEL (Office National des Elections) to conduct a fair election. These are some of the growing pains of democracy in a gradually democratizing Africa. I should add that there is a vibrant free press here with several well read opposition newspapers which will serve a watchdog function during the campaign process.